July 6, 2012 -- Steve Torrence got the Summit Racing Equipment NHRA Nationals off to a great start Friday when he produced the day’s best Top Fuel qualifying run in Norwalk, Ohio. 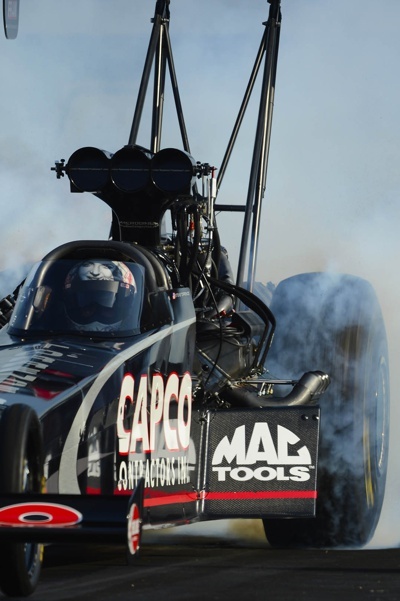 Torrence’s 1,000-foot ride in the Torrence Racing/Capco Contractors Inc. dragster lasted 3.829 seconds at 319.98 mph in cooler evening temperatures and put him on top after two runs. “It was extremely hot here today,” he said, “but Richard Hogan, our crew chief, came up with a good combination this evening when it cooled down. I’m proud of my team because we really stepped up our performance on that run. It feels great to solidify a good starting position on the first day of qualifying”. If Torrence remains low qualifier after Saturday’s final two runs, it will be the second of No. 1 of his career. He led the field at the 4-Wide Nationals in Charlotte in April. Torrence’s first run of 3.952 at 303.64 mph in the scorching temperatures was third quickest of the session. “The track temperature was 140 degrees during the afternoon,” he said.